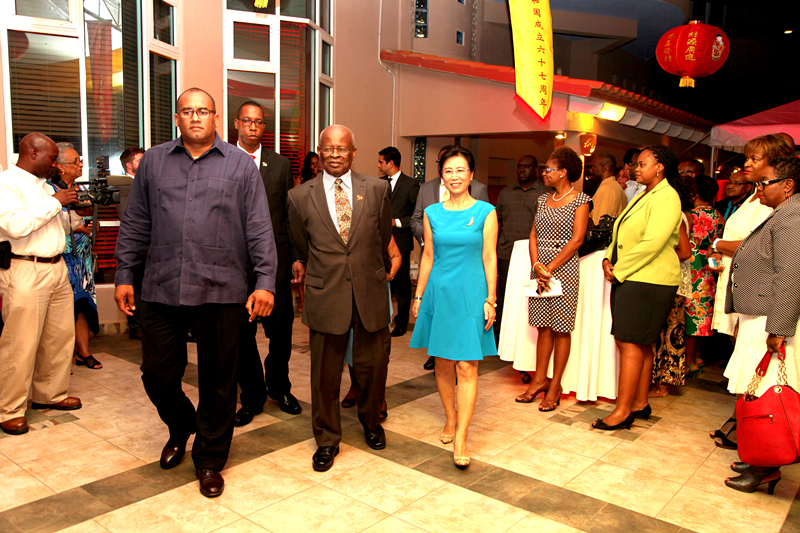 On September 26, H. E. Ms. Wang Ke, the Chinese Ambassador to Barbados, hosted a Reception to celebrate the 67th anniversary of the founding of the People’s Republic of China at the Accra Beach Hotel. H.E. Sir Elliott Belgrave, Governor-General of Barbados, Hon. Richard Sealy, the Acting Prime Minister, Hon. Sir Marston Gibson, Chief Justice and several Cabinet Ministers, Members of Parliament, senators, representatives from the diplomatic corps, representatives from a wide range of sectors in Barbados, representatives from Chinese Association and Chinese Companies in Barbados, Confucius Institute of University of West Indies, Cave Hill Campus are among 300 plus guests who attended the reception. In her remarks, Ambassador Wang Ke pointed out that in the past 67 years, especially in the past 38 years since China adopted its Reform and Opening-up Policy, great achievements and dramatic changes have taken place. China now ranks in the world the second largest economy, the biggest trader of goods and the third largest direct overseas investor. The life of 1.3 billion Chinese people has been significantly improved. In the first half of 2016, China’s GDP growth is 6.7% which continues to be at the forefront of the world’s major economies and it will bring more opportunities to the whole world. Ambassador Wang Ke also reviewed the fruitful pragmatic cooperation between China and Barbados in all fields including politics, economy and trade, military, education and cultural, hoping that China and Barbados could take the 40 years of diplomatic ties in 2017 as a new start to continue to be committed to each other and forge ahead into an even better future of friendly cooperation. On behalf of the Barbadian government and people, Acting Prime Minister Sealy congratulated the 67th anniversary of the founding of the People’s Republic of China and conveyed the best wishes from Prime Minister The Rt. Hon. Freundel Stuart. He commended China on the unprecedented development and prosperity which it is presently enjoying due to the commitment and fore-sight of the Chinese people. He also spoke highly of the development of bilateral relations and cooperation, expressed his appreciation for China’s contribution to the economic and social development of Barbados and said that Barbados is willing to work together with China to take the 40 years of diplomatic ties next year as a new start to enhance the mutual beneficial cooperation so as to promote new and better development of bilateral ties between Barbados and China.